TRIAL OF THE FIRST MASS TRESPASS into drone base RAF Waddington is due to take place on Monday 7th October, the 12 year anniversary of the Afghan invasion, where six peace campaigners will stand trial for “criminal damage” in Lincoln for cutting into the base, displaying news articles about drone civilian child victims and planting a peace garden. The six include Dr Rev. Keith Hebden, grandmother Penny Walker, drones researcher Chris Cole, teacher Henrietta Cullinan, pensioner Susan Clarkson and Father Martin Newell who will plead ‘not guilty’ and intend to argue that their actions were reasonable in the circumstances, while questioning the legality and morality of drones and highlighting the current MoD secrecy which shrouds the deaths of hundreds of civilians. 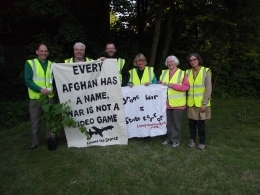 The trial also happens to fall within the drones week of action 5-12th October where members of the group will tour the UK speaking about the true cost of drone warfare both financially, ethically and to the cost of lives. “It is highly likely that the UK’s current use of drones is unlawful. There is a strong probability that the UK has misdirected itself as to the requirements of the International Humanitarian Law (IHL) principles of proportionality, distinction and humanity and as to its human rights obligation to protect human life and to investigate all deaths (civilians and combatants alike) arguably caused in breach of that obligation." 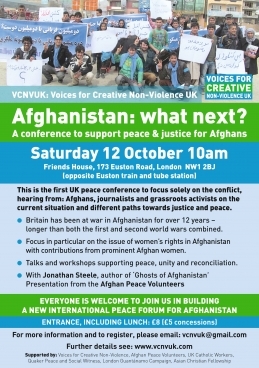 A day organized by Afghan and British peace activists both in the UK and in Afghanistan. We are coming together to learn about and discuss practical methods of supporting non-violent peace in the run up to the uncertainty and greatly awaited 2014 troops withdrawal. This grassroots event will blend cutting edge analysis from Guardian journalist Jonathan Steele who will talk about the facts behind the run up to the war which kicked off the global war on terror; and speaking to ordinary Afghan women and youth currently living in Kabul. Afghans living in Britain will talk about the importance of Afghan unity and support needed from our ever growing UK peace movement. Afghan Women speak live on Skype from Kabul A group of 30 women who run a sewing cooperative in Kabul making duvets for refugees and the poor of Kabul. For many of these ordinary Afghan women this is the first job they have ever had and it will certainly be the first time their voices will have been heard outside the home. A ‘never before tried’ linking of UK-based peace campaigners and ordinary Afghan women. Plus a testimony from an Afghan woman who has recently gained asylum in the UK: she will briefly talk about her personal experiences of living in Afghanistan and the issues women face. Afghan Peace Volunteers speak to us via a video message - a unique opportunity to meet and question members of one of the few non-violent peace groups in Afghanistan who live in a mixed ethnic community and draw inspiration from Gandhi and Martin Luther King- an incredible and historically monumental group in the international peace movement today. The first three workshops last an hour and are repeated so you can attend two of them during the afternoon. “The Dark Side”: Secret Prisons, Torture & the War on Terror: Led by London Guantanamo Campaign’s Aisha Maniar. Drones: the true cost of war: led by US drone activist Brian Terrell with Chris Cole and Mary Dobbing of Drone Wars UK. Meet the Afghan Peace Volunteers live from Kabul on Skype, ask them questions about non-violent peace making in Afghanistan, share any thoughts from the day, and send messages of solidarity and support. There will be an English to Dari translator at the conference, the organizers would be extremely grateful if you could inform them if you would like translation assistance on the day.